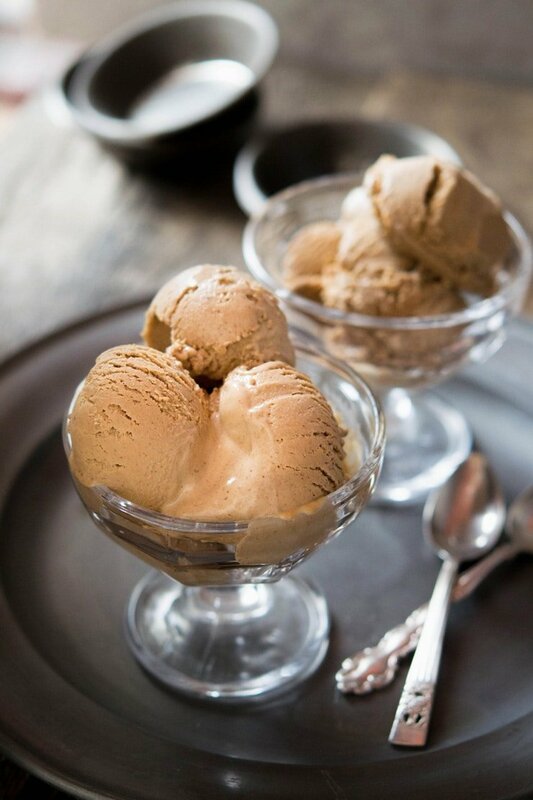 Decadent, smooth and creamy chocolate hazelnut ice cream made with homemade chocolate hazelnut spread. A fun and easy recipe the whole family will enjoy! After posting my recipe for homemade Nutella a couple of weeks ago I had a ton of chocolate spread to use up and what better way to use it than to make it into another yummy dessert? Oh yes, this chocolate hazelnut ice cream is insanely delicious, time to get the ice cream machine out again. Making homemade ice cream is so much fun, my last recipe was Tiramisu flavour and omg it’s so good. This chocolate hazelnut ice cream is way up there, it’s smooth, creamy and has the most mouthwatering nutty chocolatey flavour, seriously yum! I know it’s getting a bit chilly now (woohoo) but to me, ice cream is for any day of the year. Being from Scotland I didn’t have scorching hot summers to enjoy a cool and creamy frozen treat, as long as you’re nice and cosy inside it’s perfectly acceptable to eat ice cream as far as I’m concerned. Also since living in Italy, I’ve been pleasantly surprised to see Italians eating Ice cream all year long, going for a stroll all wrapped up holding a cone on a chilly Sunday afternoon is not a rare sight. To make this decadent ice cream I simply followed my basic recipe and added the chocolate spread in at the end. It was seriously simple and the more you make ice cream the easier it gets. I always whisk the egg yolks and sugar together first until it’s pale and thick. I do this by hand but you can use a stand mixer or electric whisk to speed things up. Then I bring the cream and milk to a boil, I didn’t add any vanilla because I personally don’t think it needs it but feel free to adapt the recipe to your liking. The hot cream is then poured into the egg yolk mixture a little at a time whilst constantly whisking. Tip: Make sure you add the hot cream very slowly whilst whisking the egg yolks to stop the eggs from scrambling. If the cream is added too quickly or you don’t whisk the mixture the eggs will most definitely scramble which ain’t nice for ice cream. P.S Looking for an ice cream machine but don’t know what one to go for? Then you should check out Carl at Dream Scoops, he has a fantastic guide on all the pros and cons of a ton of machines for all budget types plus a ton of info on all you need to know about ice cream, it’s definitely worth a read! Once it’s all combined, pour the mixture back into a saucepan and heat it over a low heat until it’s thick enough to coat the back of a wooden spoon, make sure to stir the mixture constantly until this happens. Once it’s ready remove it from the heat and add the chocolate spread if you are not using your own homemade chocolate spread then use a good quality spread. Whisk it into the hot cream mixture until it’s melted and thoroughly mixed together. Finally set it aside to cool then follow the manufacturers’ instructions on your ice cream machine. All that’s left to do is wait for the magic to happen and you’ll soon be in nutty, chocolatey ice cream heaven! Find my recommendation for a low-cost ice cream machine here (the one I use). 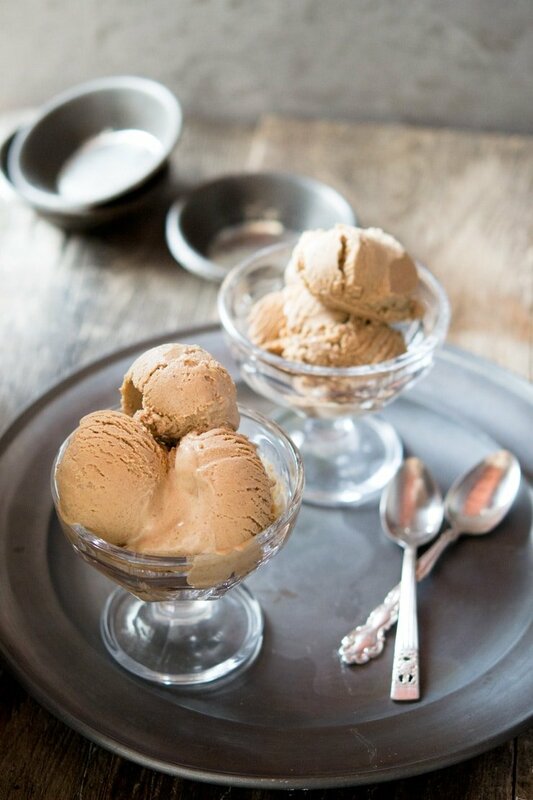 If you’ve tried this chocolate hazelnut ice cream or any other recipe on the blog then don’t forget to rate the recipe and let me know how you got on in the comments below, I love hearing from you! You can also FOLLOW ME on FACEBOOK, TWITTER, INSTAGRAM and PINTEREST to see more delicious food and what I’m getting up to. Add the egg yolks and sugar to a bowl and whisk until pale and thick. Add the cream and milk to a sauce pan and bring to a boil. Remove from the heat and add a splash to the egg yolks and sugar whilst constantly whisking, continue to add the hot cream to the egg yolks whilst whisking until it’s all mixed together. Pour the mixture back into the sauce pan and heat on a low heat. Stir with a wooden spoon until the mixture has thickened enough to coat the back of the wooden spoon (around 7-10 minutes). Remove from the heat and add the chocolate spread, whisk until thoroughly combined and set aside to cool. Once cooled pour the mixture into you ice cream machine following the manufacturers’ instructions. 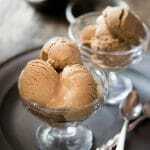 Once ready spoon the ice cream into a freezer proof container and freeze until ready to serve. Thanks so much Bintu, you really can’t go wrong with this combo can you? What a delicious recipe, looks pretty simple too! What a great use of a chocolate spread such as nutella. Even though it’s only breakfast time and I check out this recipe, I am thinking I want to try this now! This looks absolutely delicious and I must try it ASAP! 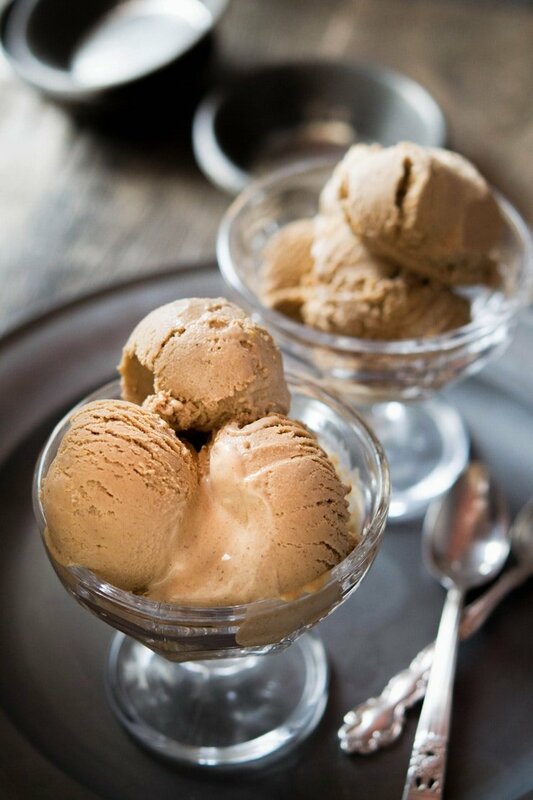 Just looking at these photos I can almost taste this ice cream, what a fabulous flavor! This sounds amazing! I bet I wouldn’t be able to stop eating it.